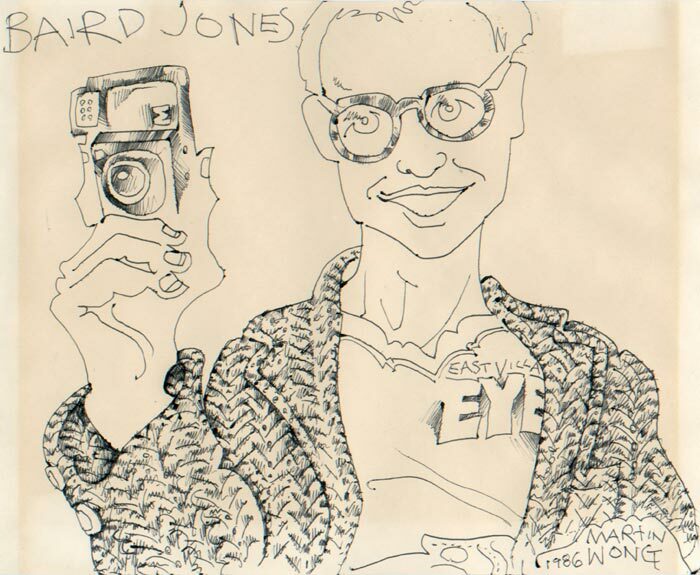 Few people personify the free-wheeling, polymorphous spirit of fin-de-siècle downtown New York as well as the idiosyncratic curator, club party promoter, photographer, author, and celebrity gossip Baird Jones. 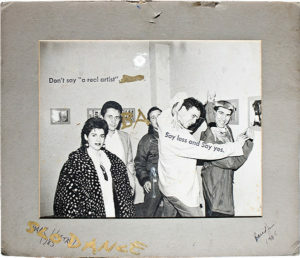 A product of Northeast prep schools, Baird entered the nightlife business in the early 1980s—the last days of Studio 54—and would continue throwing parties into the 2000s. 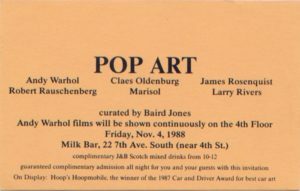 But he also had bigger ambitions, using the ’80s convergence of nightlife and the art world as a corridor to infiltrate galleries and museums. 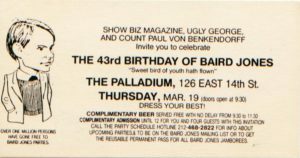 Baird’s reputation lives on primarily through the coveted party invitations that he issued in a continual stream for a quarter century. 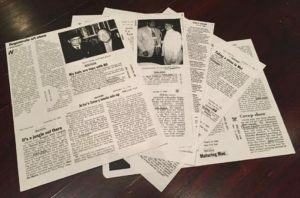 These enticing descriptions of offbeat entertainments, typeset in plain text on colored paper, now read like a printed-out Twitter feed, documents of his creative mind. 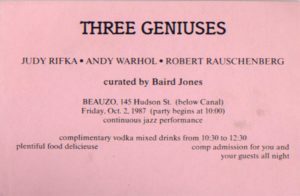 They reflect the confusing mix of art, commerce, fun, provocation, and self-serving intellectualizing that marked the era, and reveal Baird as a new kind of art hybrid, whose exercises in self- and nightclub-promotion introduced new forms of conceptual and performance art. 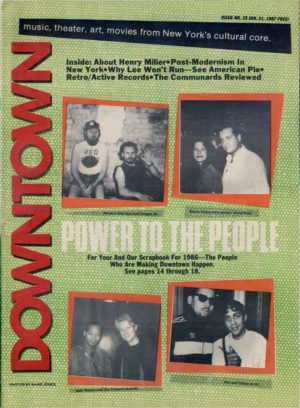 Central to Baird’s “aesthetic” was the power of celebrity, a fascination inherited from his father, Cranston Jones, a Time editor and founder of People magazine. 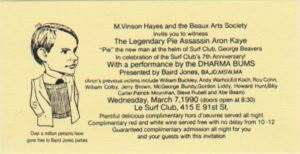 But Baird’s definition of “celebrity” went beyond an infatuation with the A-list to encompass his own Warholian stable of “superstars”—Yippie “pie man” Aron Kay, low-tier aristocrat Countess Erme Klent-de-Boen, Danny the Wonder Pony—who could be counted on as nightclub entertainment. 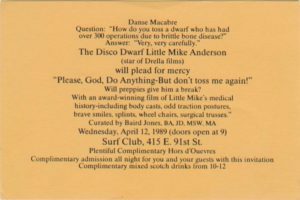 With dwarf actor Mike Anderson (of David Lynch’s Twin Peaks), Baird pushed the limits of propriety: his “dwarf tossing” and “midget bowling” events drew the attention of New York governor Mario Cuomo, who signed legislation banning them in 1990. 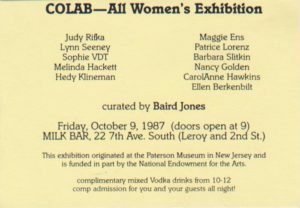 Other parties featured exhibitions drawn from Baird’s huge collection of “celebrity art,” by Miles Davis, Leni Riefenstahl, Charles Manson, Whoopi Goldberg, and many others. Of course, the celebrities and criminals behind the artworks never showed up (except, once, Tiny Tim). Baird supplemented these P.T. Barnum-like spectacles with ostensibly more serious pursuits. 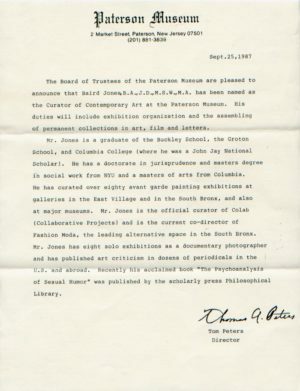 He struck deals with under-funded and under-attended museums, bringing his celebrity art collection to Stamford, CT, and Trenton and Paterson, NJ (where he was officially appointed as a curator). 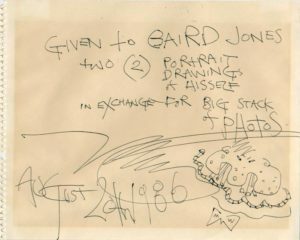 This clever move established a pedigree for Baird and his collection, and, done more blatantly, would have made him a pioneer of institutional critique. The same unique ability to mix “high” and “low” comes through in Baird’s writing (his 1987 book Sexual Humor attempts a Freudian analysis of R-rated jokes and cartoons) and in his photography, where he combined the roles of artist and paparazzo. 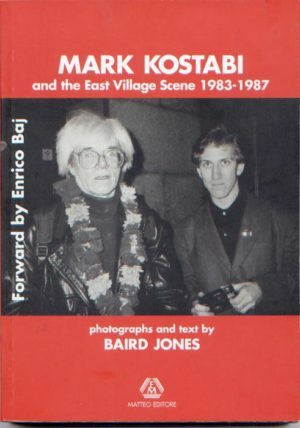 His “masterpiece” was his obsessive trailing of young East Village art star Mark Kostabi, whom Baird photographed grinning sardonically next to fans, scenesters, and media figures. 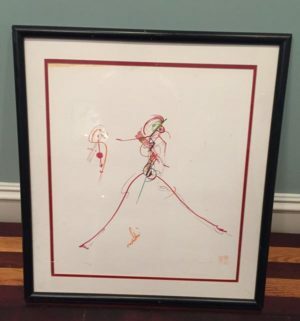 These portraits were exhibited at gallery events called “Kosthappenings,” where Baird would take even more pictures of Kostabi. The series now comes across as a precursor to today’s celebrity selfie. 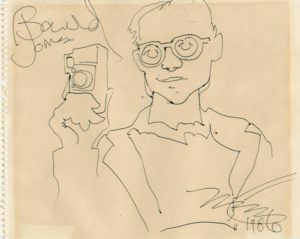 When Baird died, in 2008, the New York Times ran the headline “Man Departs a Life Lived on the Fringes of Fame.” We can now see Baird’s life as much more than that: a conceptual force in the ’80s East Village, whose oeuvre of witty actions epitomized an era when artists were celebrities, party-givers were curators, and art was fun—or at least tried to be.